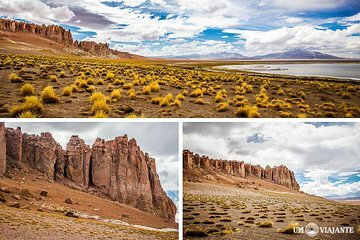 Explore Chile’s Salar de Tara on a full-day excursion from San Pedro de Atacama. Travel in a comfortable van and take in spectacular views of the Paso de Jama mountain pass. See towering stone formations, volcanic ash formations, the famous sand-carved cathedrals, and multi-colored lagoons filled with flamingos. A photo stop at the Mirador del Bofedal de Quepiaco is also included. Valid from the time you exchange your voucher, for the consecutive days selected.